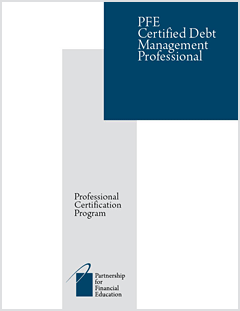 The PFE Certified Debt Management Professional (CDMP) program was developed to ensure professionals providing debt management and related services have the knowledge and expertise required of them by employers, consumers and regulators. The mission of the Partnership for Financial Education is to advance the professional education of those who work with consumers in the field of personal finance. Read the full content outline. CEUs in ETHICS and PREPARING FOR COLLEGE are currently available through the Partnership for Financial Education. The PFE Certified Debt Management Professional (CDMP) program is approved for the certification of counselors by the following states/jurisdictions: DE,ME,MI,PA,NV,RI,USVI and UT.